Admiral Scheer (Captain Theodor Krancke) visiting with German raider Thor, somewhere west of St. Helena, 26 December 1940. The boat is perhaps bringing over meat and eggs from captured refrigerated ship Duquesa (not shown). This photo may have been taken from supply ship Nordmark, also present to stock up from the Duquesa. Italian/Greek Campaign: Greek I Corps throw an attack at the Italians defending Leskoviki in southern Albania on 26 December 1940. The Italians give ground along the line of the Chimara River. 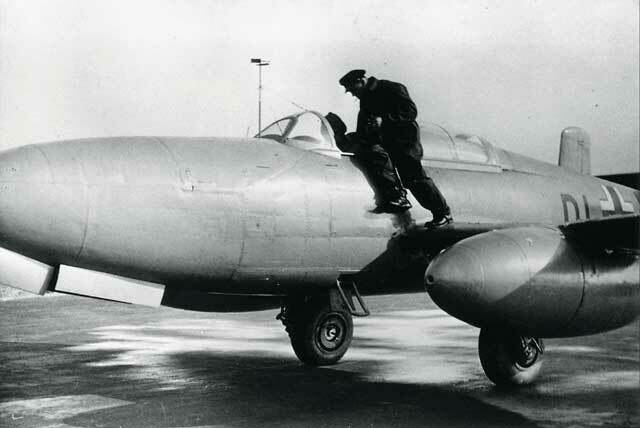 European Air Operations: After a lull for Christmas, bombing resumes during the day. RAF Bomber Command launches day raids on Brittany airfields and shipping at Le Treport. It sends a night raid against Bordeaux. With all this recent attention being paid to the French coast, it is tempting to assume that the British know of Hitler's visit (see below) and aim to make things a bit hotter for him. The Luftwaffe sends one bomber on a raid against the Isle of Sheppey (in the Thames Estuary) during the day, but stays on the ground after dark. 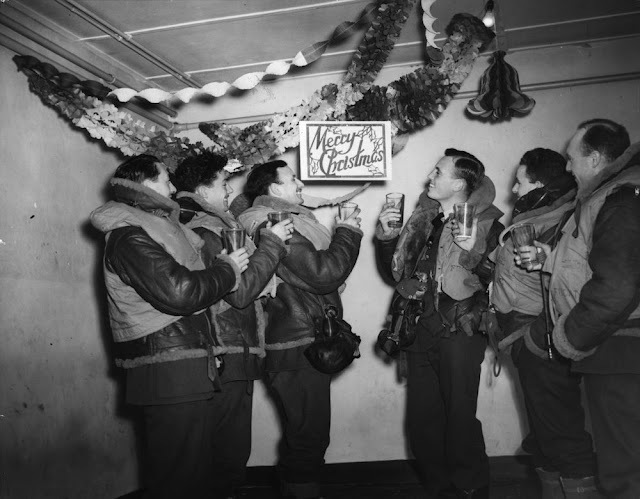 RAF bomber crew celebrating Boxing Day, 26 December 1940 (Photo by Arthur Tanner/Fox Photos/Getty Images). Battle of the Atlantic: U-95 (Kptlt. Gerd Schreiber) is operating about 250 km northwest of Rockall when it torpedoes and badly damages 12,823 ton armed merchantman (refrigerated cargo ship) Waiotira. The Waiotira is in bad shape and the crew abandons ship, leaving it a floating derelict, but U-95 has to leave the area due to the presence of three Royal Navy destroyers. There is one death, 90 survivors. Royal Navy minesweeper MAC 5 hits a mine northeast of Gunfleet, Essex and sinks. There are 4-5 deaths. Italian submarine Calvi claims to have sunk a British freighter today, but there is no confirmation of this in the British records. British 92 ton drifter True Accord collides with 316 ton armed trawler HMT Saronta at Yarmouth. True Accord sinks, but apparently there are no casualties. Royal Navy sloop HMS Pelican collides with anti-submarine trawler HMT Cape Portland. The damage is not severe, but will require some repairs in London when time permits. Royal Navy boarding vessel HMS Maron seizes 928 ton Vichy French trawler Joseph Duhamel near Casablanca and takes it to Gibraltar. Royal Navy light cruiser HMS Bonaventure intercepts 8803 ton German freighter Baden between Tenerife, Canary Islands and France. The German crew of the Baden scuttles the ship. Admiral Wilhelm Meisel on board the Admiral Hipper continues sailing back to Brest after the abortive Christmas attack on Convoy WS 5. The crew of the Admiral Scheer has a happy rendezvous with German raider Thor shortly after breakfast. It takes place several hundred miles west of St. Helena in the mid-Atlantic at point "Andalusien" 15°S 18°W. It is a very merry gathering for the Kriegsmarine, with half the British fleet out looking for the German ships to no avail. Thor is operating as Yugoslav freighter "Vir" since its victory over British armed merchant cruiser Carnarvon Castle on 5 December. The Scheer has the captured refrigerator ship Duquesa nearby, stocked with huge quantities of eggs and fresh meat. This stockpile makes meals during this voyage a great pleasure for the men of the Scheer and, now, the Thor. Tanker Eurofeld also joins the party at some point, which apparently lasts for several days. There is some disagreement in the sources about exactly which ships show up on which dates for this meeting with Admiral Scheer. However, there is no question that the Admiral Scheer, the Thor, the Duquesa, the Nordmark and the Eurofeld are all present at some point, and all present together at some point. Some sources confuse this meeting with another meeting involving German raider Pinguin and its captured Norwegian whaling fleet, but that takes place in early 1941 (though already on this date the Pinguin's crew is plotting their interception of those ships). Convoy OB 265 departs from Liverpool, Convoy HX 99 departs from Halifax, Convoy AN 11 departs from Port Said, Convoy BN 11A departs from Port Sudan. Light cruiser USS Denver laid down at New York Shipbuilding Corp. of Camden, New Jersey. It is the second naval ship named for Denver. Battle of the Mediterranean: Activity is light in North Africa as the British bring up Australian troops for the next phase of operations. Australian destroyer HMAS Waterhen seizes Italian schooner Tireremo Diritto as it makes its way from Tobruk to Bardia. The Australians disembark the crew, then scuttle the schooner. There is a revolt against Italian rule in Southern Abyssinia (Ethiopia). 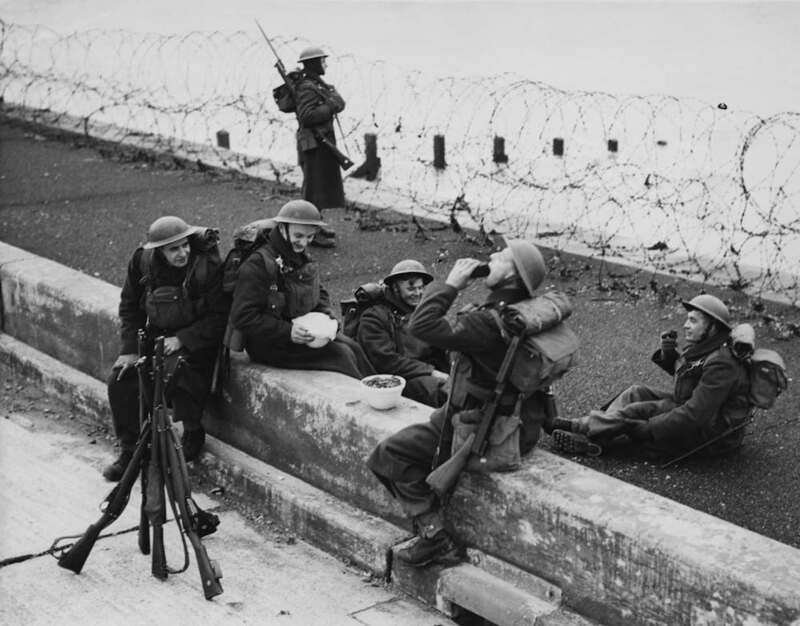 British soldiers enjoying Boxing Day, 26 December 1940 (Photo by David Parker/Fox Photos/Hulton Archive/Getty Images). German Government: Hitler winds up his meandering journeys along the French coast. Having spent the night in his train parked within a tunnel near Metz, he visits the city and spends some time with the SS based there. After lunch, he re-boards the train and proceeds to Sarrebourg, then back to Germany. British Government: Winston Churchill resumes his attention to the Ministry of Supply. He instructs the Minister, Sir Andrew Duncan, to increase ammunition stocks for antitank rifles, 2-inch mortars, and 3-inch mortars. He also sends a memo to the Admiralty, telling Admiral of the Fleet Sir Dudley Pound to mine "the Leads," through which German ore traffic from Narvik passes. Captain David Margesson is sworn in as the new Secretary of State for War, succeeding Anthony Eden. 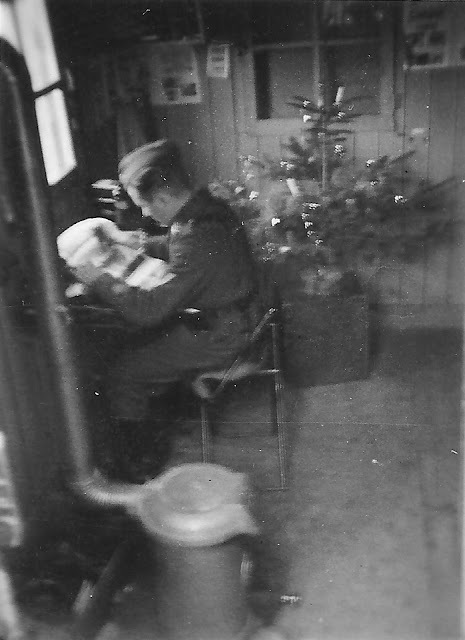 A German soldier posted to Ameland in the West Frisian Islands in northern Holland celebrating the holiday, 26 December 1940. Bulgaria: In a show of defiance at Hitler, the Bulgarian assembly fails to pass a resolution asking King Boris to join the Tripartite Pact. Philippines: Brigadier General Leonard T. Gerow, acting chief of the US War Plans Division and an old China hand, recommends that troop strength in the Philippines be roughly doubled in size and $1.25 million in new military construction there be authorized. This is not a universally accepted proposal. The problem is that the United States has neglected not only the Philippines, but also bases ranging from Alaska down to Panama. Naval planners worry that sending too large a force to the Philippines could leave the United States itself in danger, especially if the British were to continue weakening in the Pacific Theater. Gerow's proposal is a reflection of a debate raging between the naval and army war planners about whether the US should adopt a purely defensive posture in the Pacific (favored by the Navy), or a more aggressive stance (favored by the army). The recent Rainbow 3 plan filed by the Navy is being revised by a joint committee of navy and army planners to see if they can agree on some middle ground. Gerow clearly is on the side of the army and wants a stronger US military presence deep in the Pacific. American Homefront: "The Philadelphia Story" opens in New York, premiering at Radio City Music Hall. James Stewart, Cary Grant and Katharine Hepburn lead the cast in this well-received George Cukor film. "My Sister Eileen," a play by Joseph A. Fields and Jerome Chodorov, premieres at the Biltmore Theatre on Broadway. 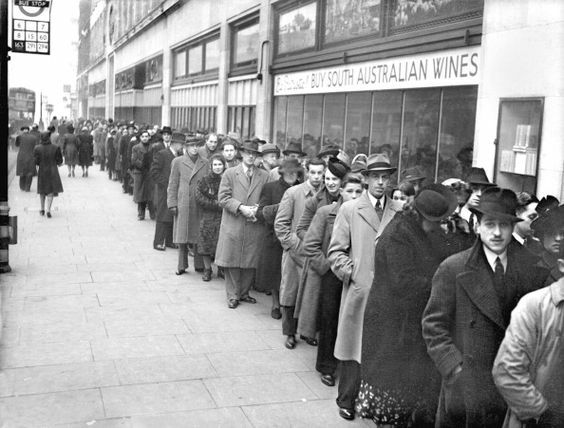 Looking more like an unemployment queue than anything, this actually is a long line of people - mostly men, apparently - outside the Marble Arch Pavilion in London. They are getting out of the house for a bit to see Charlie Chaplin's "The Great Dictator," which obviously is still drawing crowds. (Photo by Planet News Archive/SSPL/Getty Images).